The new Indian Direct Taxes Code (DTC) Bill proposed to be introduced from financial year 2012. The proposed Code is currently being scrutinized by the Indian Parliament. 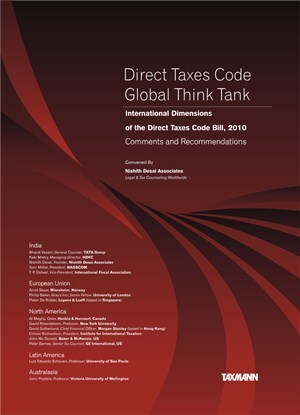 Taking the opportunity to provide comments and recommendations on the New Code, the DTC Global Think Tank convened by Nishith Desai Associates analyses some of its key international Dimensions. The members of the DTC Global Think Tank have significant expertise and experience in international tax policy and include renowned academicians, jurists, public policy experts and industry leaders from developed and developing countries. The report of the DTC Global Think Tank provides interesting insights and an objective assessment of legal, constitutional and international law implications of specific DTC proposals that impact the global business community. The members of the Think Tank argue in favor of a robust, fair, stable, sustainable and trust based tax regime that would enhance India’s participation in international trade and investment flows and facilitate its emergence as a responsible economic power.